This page was last updated on 1/27/07!! Holly is shown here winning a Toy Group 1st under judge Mrs Murrel Purkhiser. She is breeder/owner/handled by Tonia Holibaugh. Holly is to be campaigned in 2006, watch for her in the ring! Chance finished his champion title winning 3 majors on the competitve January Florida Circuit. He is owned and bred by Jeanette Stimson and handled by Tonia Holibaugh. 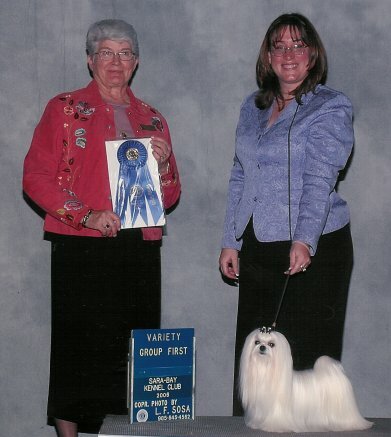 #1 Maltese Breed Points in 2006!!!! #1 Smooth Dachshund Breed Points in 2006!!!! In the History of the Breed!!! !